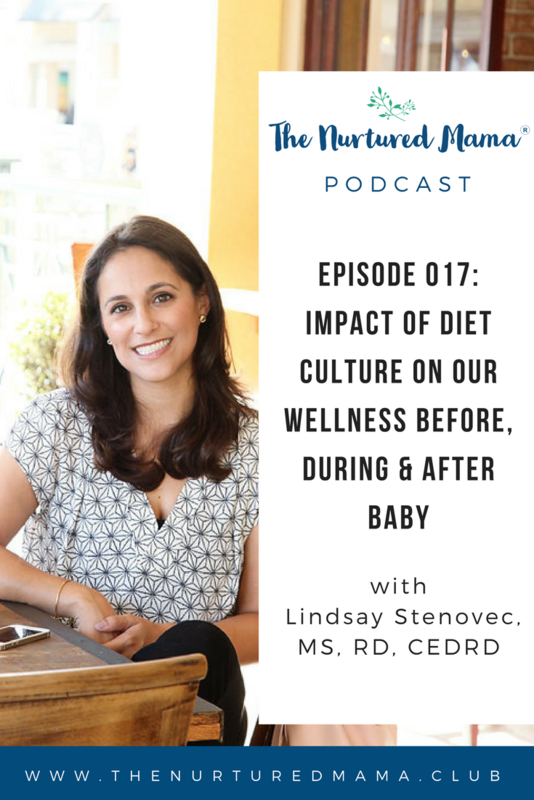 Lindsay Stenovec, MS, RD, CEDRD, CLEC is the founder of TheNurturedMama.Club – an online body positive wellness community for moms and moms-to-be and the owner of Nutrition Instincts – a San Diego-based nutrition private practice specializing in eating disorders, intuitive eating, maternal wellness and family feeding. Her mission is the help women and mothers reduce stress and guilt around food and movement by restoring their trust in their bodies, taking weight obsession out of the equation and re-defining health and self-care so that each woman, mother & family can thrive. 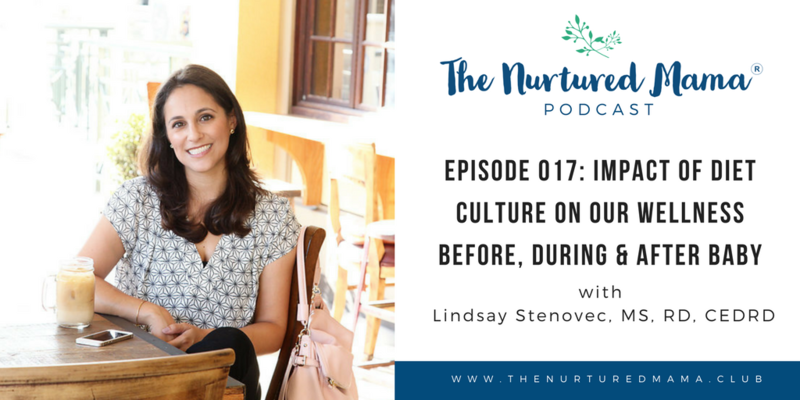 She is the host of The Nurtured Mama Podcast and creator of Eat. Be. Nurture – An online program that helps mamas eat with joy, live in the moment and nurture their inner power. Lindsay lives in San Diego with her husband and 3-year old son. She’s happy to share that she is expected baby boy #2 in early 2018. 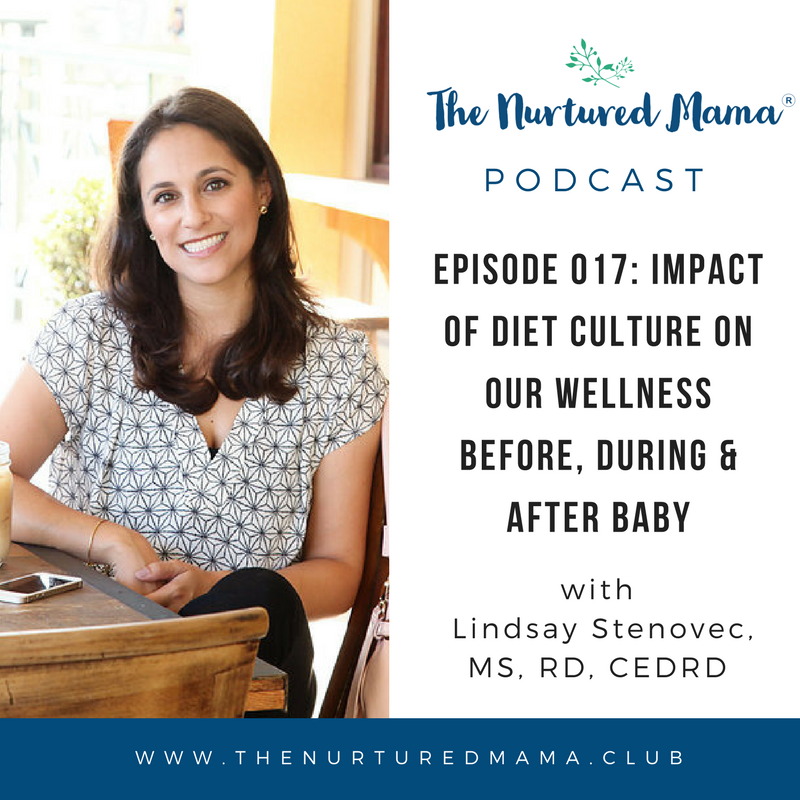 In this solo podcast, Lindsay dives into the topic of diet culture and the impact it has on a mother’s wellness before, during and after baby. 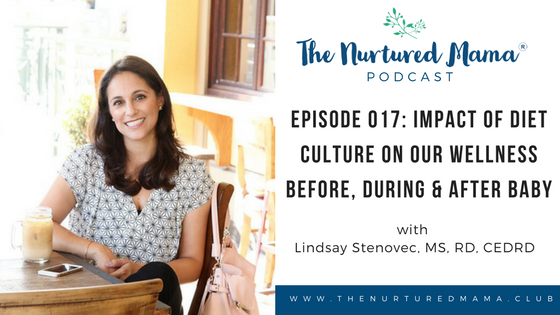 From a very young age, a foundation is laid for us in Western culture – your body can’t be trusted, your weight determines your health and worth and, particularly as women, you should spend large amounts of time distracted by food and body “stuff.” This episode looks at how this foundation sets us up for challenges with food and body before, during and after pregnancy and why we must challenge these messages. You CAN opt out of diet culture! Want to boost your body mindset during and after baby? Want to continue the conversation? Join us over at the Nurtured Mama Community on Facebook!